Short on time? Want to make something different and healthy for your New Year's party? Try this "Veggie Shot". Won't your guests be amazed at your ability to make a lovely appetizer? AND, there is no cooking involved - just slicing. First, you must find 10 shot glasses or how many you need for your party. They were selling 4 for $10 at Target, so if you have the $$ - buy them there. Alternatively, you could go to a thrift store near you (Salvation Army, Good Will, etc.). There are always a ton of shot glasses (in varying shapes and sizes which would be more fun), and they might hit you for 25 cents each. Since I got rid of my shot glasses after I had kids, I had to borrow these from my neighbor, Laura. Borrowing them is also a great way to get enough for your party. 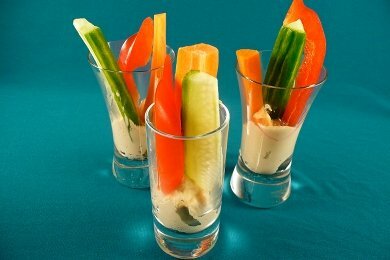 You can use hummus, Yogurt Dip or any other veggie dip that you like for the glasses. And put whatever veggies that you like in the glass - lettuce, Sugar Snap Peas, jicama, etc. would be great additions. Place a plate of extra sliced veggies near the shot glasses so people can finish their dip if there is some still left in the glass. This will help with washing them. The only problem with this party snack is that the glasses are difficult to clean. I got out my baby bottle washer (which I also use for my wine glasses) to get the dip out of the bottom of the glass. But, it was worth it! Almost all of the calories in this snack come from the hummus. I found that I used less than a tablespoon to make it work so play with it a bit. Put 1 tablespoon hummus into bottom of shot glass. Peel carrots. Slice carrots, red peppers, cucumber, and celery into 2 inch strips. Place veggies in shot glasses artfully. Leave out veggies that don't fit (or slice some extra ones) for additional dipping. Please share your favorite healthy party snack. This is such a cute idea! I'm definitely using it for parties. Wow! What a nice idea for cru-d-ete! I like that you can hold it and snack while you sit or stand and talk. It's a great idea! I will definitely be doing this at my next gathering, such an adorable idea! What a neat idea! Love it...thanks for sharing! No parties in my future, but I love this idea! I'm thinking my kids will love the idea of eating veggies out of a tiny glass. Hey, today they saw Pop-eye on a package of spinache in the grocery store and begged to buy it. Then they gobbled it up at dinner, go figure. Whatever works! Thanks for the fun idea, we're huge hummus fans. Love this idea. I have a number of tall shot glasses (found at Goodwill) that I had bought to make mini desserts and now I have a second use for them. Also, Kohl's had a nice set of tall shotglasses, but only buy them when they are half price and you have a 30% off coupon!